If you’re having a long day, a hard day’s journey into night, or a bad hair day, no one can brighten your POV like Anna Choi. Spend 30 seconds with her, and you, too, can light up a room. She is kinetic energy personified, and it’s catching. Just by watching Vibe Founding40 member and social business coach Anna Choi laugh (a huge laugh from a tiny being) you, too, can light up a room. This conscious coach is helping to bolster social entrepreneurs and social enterprise (or “socent”) in Kitsap County and beyond—inciting businesses and persons to raise their consciousness. 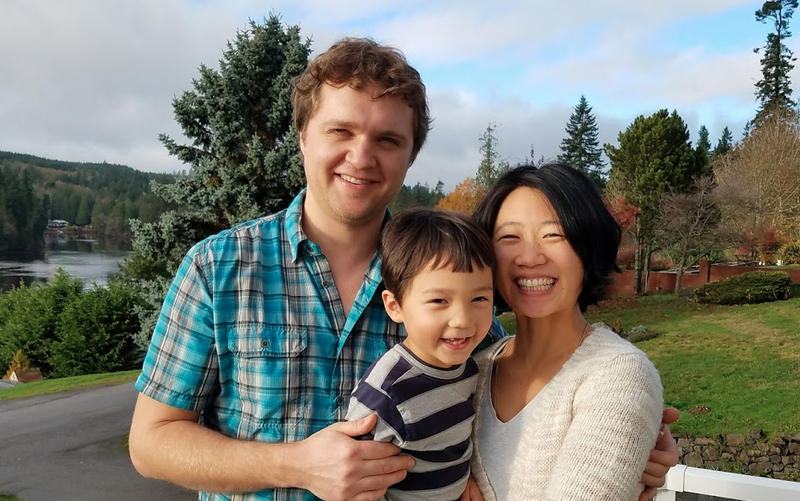 Co-chair of the WA State Chapter of the Social Enterprise Alliance, Anna believes that the socent movement is gaining ground in our community, focused on the 'triple bottom line' of people, planet and profit. On the heels of a tour organized for Vibe Founding40 members (Anna is number 40! ), Anna is also exploring an affiliation with Bremerton-Kitsap Access Television (BKAT) to profile businesses as a force for good, sharing stories about local talent and leaderships. "What's the real journey they took to become social entrepreneurs? We can connect our region with the broader national market's resources to bring in more growth and innovation, strengthening that triple bottom line economy," she adds. "Kitsap is poised to be a model county for how to stimulate a thriving social entrepreneur community." Energy is Anna’s byword, password and keyword. Here's how she charges herself up, wherever she goes. Why does conscious entrepreneurship matter so much in this day and age? Anna: I believe conscious business, or social entrepreneurship, is not a passing trend, but simply how business will need to be done to be profitable long-term. Every business makes an impact in the ecosystem of community and the planet we live on—whether they are conscious of it or not. The question is how positive an impact will they choose to make. If we keep doing what we’re doing, living with a business model that’s solely profit driven, well, it’s just not sustainable for the planet, for families working too hard to make living wages. You have to wonder why certain products are so cheap—it comes at a cost somewhere else in the supply chain. Profitability is important, too. We just need to pay attention to putting care of the planet and her people first. Social impact then becomes inevitable. Business as a force for good. That’s the new age of enterprise. Augusta, Georgia is your hometown. What was it like growing up there? Anna: It was hot and humid and southern-friendly hospitality. We were the only Korean family in the neighborhood. We used to have these huge gatherings of cousins at Myrtle Beach, South Carolina each summer. I still love the East Coast sandy-warm-water-big-wave beaches. We’d fly kites or build sand castles. I have fond memories of my mom (the best cook ever!!) cooking all day in the kitchen, making delicious Korean feasts when we hosted these huge get-togethers at our home for, like, 5 to 10 families. All the kids, most of whom I had never met, would gather downstairs and play while all the grown-ups visited upstairs. Every once in a while, they'd make us go perform using instruments and the like in front of everyone. I didn't realize it then, but it was awesome to have other Korean-American kids to connect with. None of us spoke much Korean, but we grew up second-generation Korean. It's so neat now to see so many Asians are represented in media or at the Olympics for the American team now! That was unseen back when I was a kid. What did you always dream of becoming? Anna: A change maker. Making a big difference in the world and utilizing my passion. A global leader for transformational social impact! Your expertise is highly diverse. What do you love most about what you do? Anna: Transforming my clients from scattered, urgent overachievers into rounded, clear, inspired action takers, producing unprecedented results as social entrepreneurs. [laugh] What I actually sell is clarity, focus, fun and accountability. Tell us a bit about the next steps for the Vibe partner-powered series, Social Entrepreneurs Unite! Anna: This fall, we’re planning to pilot an online social entrepreneur directory to build community. In early 2019, we’ll launch that web platform, kicking off with a public community event to showcase social entrepreneur leaders here locally. We hope they will then share their journey more in depth at our monthly Social Entrepreneurs Unite! gatherings. The Vibe partnered-powered series Social Entrepreneurs Unite! is led by Anna Choi. Bring a friend and join us on the 1st Friday of every month from 9:30-10:30am. What's the most important speech you've ever given? Anna: I often talk about the most important thing to me, which is how you energetically align your business vision. While we talk often about how to attract customers through marketing tactics, what’s equally valuable is that, as human beings, we raise our level of consciousness internally so that we shine on the outside, bringing on even greater success. What's your special recipe for conscious business coaching? Anna: Energy! I do this exercise with how to align your business mission, vision and values with what your marketing message is and your target market. And I use ENERGY as an acronym for Experience-Network-Execution-Roadmap-Guide-Your Story. I never thought of energy as a value, but I integrate it into every facet of the experience I bring and in how I train others. Radiating your brand is critical! And your signature dish as a home cook? Anna: I’m kind of vegan-ish, not a purist. I make a mean pasta and a whole wheat/pesto/veggie pizza. I do a seaweed and rice with tofu wrap thing. My mom used to make something similar in Hawaii with SPAM, but since I don’t eat meat, I kind of made it up. Anna: Possibly a congresswoman. Or a gallery owner or a children’s pre-school teacher. If I were in politics, I would lobby for children’s education and empowering businesses. I’ve always been passionate about entrepreneurship... I sometimes fantasize about being a monk. Or a performance artist. What's the ultimate treat after a tough day? Anna: There are these whole food vegan powder cookies I concoct. They’re healthy AND sweet, have all the super food nutrients, and taste like cookies—it's like cheating! If you were to come back as an animal, what animal would you be? Anna: I think my power animal is an African starling. They’ve gotta be durable and tenacious in their environment, very colorful. It looks small, but likes letting its big voice be heard far and wide. I just so resonate with that little guy! Who's been your greatest mentor or inspiration? Anna: Roger Hamilton. He is a social entrepreneur/futurist that wrote The Millionaire Master Plan. Roger created these business retreats in Bali. He lives there for work. Who wouldn’t want to go there! And he’s a multi-passionate guy. Really thought provoking in his YouTube videos. Roger launched Entrepreneur TV, which motivated me to found Social Impact TV. I admire him for bringing the integration of Eastern philosophy into Western business coaching. Anna: My son. Raising a global citizen. A warm, loving, respectful son. And joyful. He is my legacy. Give us 5 words that you hope define you in the eyes of your fellow Vibists, and others around you. Anna: Joy. Creativity. Community. Love. Fun. After 17 years in Seattle, Anna and her family have found their home (and happy place) right here in Indianola. What are your thoughts on the phrase 'the future is female'? Anna: Yes and no. It’s going to require male allies and everyone at the table to have the future of female leadership rise up. It’s about feminine leadership, not just about gender. Anna: I would love me something nutritious and delicious. Something farm to table, like at Mossback in Kingston. Delightfully tasty, packed with nutrition, from local gardens. And jammed with energy, of course! How has Vibe served your calling? Anna: Connections! Social Enterpreneurs Unite, the monthly gathering of our socent community, would not be possible without Vibe’s partnership. The best advice your family has ever given you? Anna: My sister: Don’t have a second child. You have so many other gifts to offer. My dad: You’re young with no mortgage or responsibilities. Go be an entrepreneur. You have room to fail right now. Who or what is at the top of your 'sparkle list' (vs. bucket list)? Anna: Nepal or Bhutan to meet the Dali Lama. If you could add one trait to your personality, what would you like that to be? Where's the best summer destination on the Olympic Peninsula? Anna: We’re still kind of touring around. Anywhere. It’s all gorgeous and beautiful. We love camping along the coast.